I'm cranking through four Synology NASes that recently came in. The DS413 is number three of four and it's an interesting one, too. 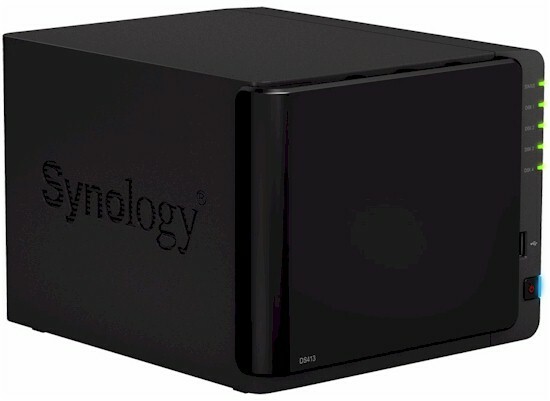 The DS413 is the four-bay offering in Synology's "Workgroups & Small Business" line. It most closely compares to the DS412+ that fills the same role in the company's "Standard Business Line". That's Synology's way of differentiating NASes built on lower-power Marvell and other processor platforms from those based on Intel archtectures. At first glance, you might mistake the DS413 for the DS412+. Both are four bay NASes packaged in the same mostly-plastic enclosure that I'm not so big a fan of. I laid out the reasons in the 412+ review, so won't repeat them here. But when you check the back panel, you'll see a key difference between the two; one Gigabit Ethernet port on the DS413 vs. two on the 412+, with link/status lights, even! The other ports are the same, i.e. two USB 3.0, one USB 2.0 and a single eSATA. In keeping with the 412+' cost-saving, no frills approach, there are no VGA or HDMI ports to support an attached console, nor is there an LCD status panel on the front. You'll have to get any information you want via the front panel LEDs or logging into the web-based admin. Since I didn't have a lot of luck getting at the DS412+' board, I didn't attempt it for the DS413 and it looks like no other reviewers did, either. So I have put what I component info I have into the comparison table below. The processor is the dual-core version of Freescale's "family of processors is designed to deliver complex application processing performance with exceptional feature integration and high-speed connectivity for IP networking and advanced media processing applications". The 413 supports all the features in Synology's DiskStation Manager (DSM) 4.1 OS. The DSM 4.1-2657 build used for testing has a very extensive feature list, which is described in Synology's DSM Highlight pages. See the DS1512+ review for a feature summary.